We've just wound the clock back to the beginning of human history, now let's tick back to the very start of each individual human life - the moment of fertilisation when egg and sperm meet. In 1978, the world welcomed Louise Brown, the first test-tube baby born by in vitro fertilisation, or IVF. Her birth sparked a heated debate about reproductive technology, and in particular, the use of human embryos for research purposes. This led to the so-called Warnock report in 1984, based on the deliberations of a committee chaired by Baroness Mary Warnock, which in turn led to 1990 legislation establishing the UK Human Fertilisation and Embryology Authority and a law banning research on human embryos grown in the lab for longer than 14 days. Until this year, this was thought to be quite a long period, as nobody was managing to grow embryos past 6 or so day, when they're a little football of cells known as a blastocyst. Then in May 2016, Cambridge University's Professor Magdalena Zernicka-Goetz and her team managed to keep embryos growing in the lab for a staggering 13 days. So should we change the law to go further and grow embryos for longer? Kat Arney met up with Magdalena at a recent (and rather noisy) conference run by the Progress Educational Trust to discuss exactly this question. Magdalena - Well, when it’s successful, after fertilisation happens and activation of the egg. This is the time when you start to see the first divisions and they go on like that until the 6th day of development. So the big egg you can say is chopped up into smaller and smaller. And then when we have quite a few of those cells, they start to decide their fate and differentiate. Their decision at that stage of life is either to form the future foetus or the placenta, or the yolk sac. So they have three fate choices they have to make within these first few days. What we discussed today about is more focus on what happens in the next 6 days of their life which was a black box of development until very recently, when we now can directly look into these 6 extra days. So we doubled the time at which we can look at the development and discover what happens to those three distinct type of cells when they start to talk to each other and prepare the foundation for the future baby. Kat - How do you do this? How do you go from this little football of cells that we can see suspended in a dish to making them start to go that extra few steps? What happens? Magdalena - So essentially, the key was that there was no culture system developed that would allow this embryo to survive outside the body of the mother. So what we have done is to find the right environment, the right ingredients, the right hormones, and growth factors which we then, as a cocktail, put into this environment to support the growth of these embryos in a dish. Kat - Because this would normally be a stage when the little embryo has started embedding in the womb and sorting itself out. Magdalena - Yes. So this will be normally the time when the embryo will implant and to get into the physical contact with the body of the mother and it was thought that this physical contact might be absolutely essential for its further development. So we showed that it’s not so. 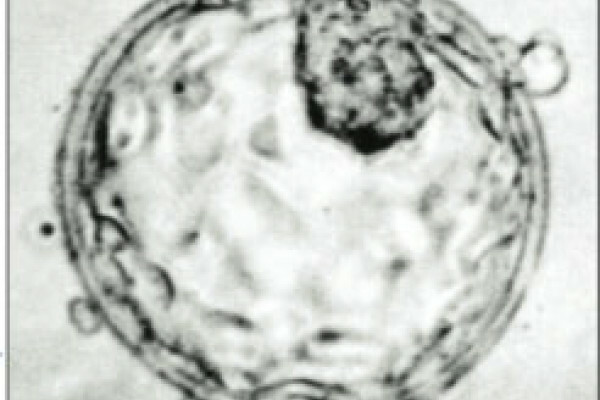 These embryos can develop outside the body of the mother for these extra 6 days. I'm sure that at that point on, they would relying on the body of the mother for lots of different things, the most important, nutrition. but since we provided them with the nutrition, they were able to self-organise themselves and progressing through development. What we have shown, that they really go through these 5 critical steps of development in a correct way. So that was very important for us. Not only see whether they can grow or not, but whether they actually take those decisions in an expected way from what we know. Kat - You’ve grown these embryos now for 13 days in this system. Can you go any further? Magdalena - No, we can't go any further. So first of all, we don’t want to go any further because there is a recognised law right now that you cannot go beyond the day 14 of development. So we stopped this one day before, in the day 13. If it were to change one day, I don’t even know whether this culture system would be supporting development beyond day 13. Kat - Why do you want to do this research? What would be the benefits of being able to grow embryos like this? Magdalena - The first critical thing is to realise that we know so much about development of many other model organisms like fruit flies, worms, and we don’t know much about development of our own embryos. Actually, at this stage of development, we have nothing like that knowledge. So this is all really black box of development. So of course, we want to understand the principles which govern normal development at this stage to be able to understand what are the conditions that make those embryos developing correctly and what are the factors that we have to take into account when they do not develop correctly. So, a lot of it is to understand basic development and therefore, curiosity as each single scientist has. But also, it has a tremendous translational implication and we discussed a lot of those for IVF clinics but also for treating diseases that manifest themselves at this stage. Kat - Magdalena Zernicka-Goetz from Cambridge University.